Julian dates are based on a count of the number of days since January 1, 4713 BCE ("before common era" which is equivalent to BC), plus fraction of a day indicated with decimal numbers. A full day goes from noon to noon, so 6 PM is a quarter of a day, or 0.25, while midnight is half a day, or 0.5, and 6 AM is three quarters, or 0.75. To calculate a Julian date from a modern calendar date, you simply figure out how many days have passed since 4713 BCE, then work out any fractions for a time other than noon. Count the number of years between 4713 BCE and your current year. For example, if the date you're converting is in 2010, you want the number of years between 4713 BCE and 2010. 4713 BCE to 0 CE is 4713 years, and from 0 CE to 2010 is another 2010 years. 0 CE itself is also one year. (CE stands for "common era" and is equivalent to AD.) Your total number of years is therefore 6724 years. Count the number of those years that were leap years. 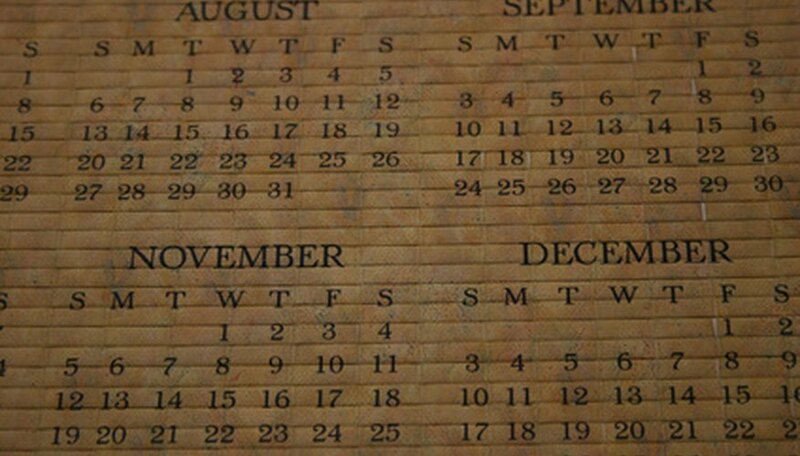 Before 1582, every fourth year was a leap year. After 1582, fourth years that fell on century changes were omitted as leap years unless they were a four hundredth year--for example, 1600 and 2000 were leap years but 1700, 1800, and 1900 were not. Multiply the number of non-leap years by 365, and the number of leap years by 366. Add the two totals together for a total number of days in all years. Subtract 10 days to account for the changeover in calendar type from Julian to Gregorian in 1582. Count the number of days between January 1 and your current day of year. For example, if the date you're converting is February 28, there are 59 days between January 1 and February 28. Add this to your total number of days. For leap years, remember to add an extra day for February 29. Count the number of seconds since noon. If your time is between midnight and noon, you want the number of seconds since yesterday noon. For example, if your time is 6:25:15 PM, 23,115 seconds have elapsed since noon. If your time is 6:25:15 AM, an additional 43,200 seconds have elapsed between noon of the previous day and midnight, giving you a total of 66,315 seconds. Divide the number of seconds by 86,400--the total number of seconds in a full day. For example, for 6:25:15 PM, 23,115 divided by 86,400 gives you a day fraction of 0.2675. For 6:25:15 AM, 66,315 divided by 86,400 is 0.7675. Add this to your day total for your fully converted Julian date. Ryan Cole has a number of degrees in science, with three papers published in the scientific literature. He has several years of work experience in technical and documentation writing, including online writing at a number of content websites, and has also tried his hand at fiction. Cole, Ryan. "How to Calculate the Julian Date." Sciencing, https://sciencing.com/calculate-julian-date-6465290.html. 25 April 2017.